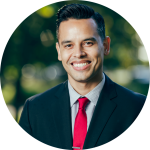 “Queens Real Estate Market JULY 2017”, by George Herrera, Realtor and Co-Owner of the Queens Home Team at Keller Williams Realty. Month’s supply climbed up to 6 months in June. This is the highest month’s supply we’ve seen since October of 2015. Month’s supply is the number we look at to gauge whether a market is in favor of buyers or sellers (i.e. Buyer’s market or Seller’s market). Month’s supply below 6 months is said to favor seller’s and month’s supply over 6 month’s is said to favor buyers. When month’s supply is at 6 months, the market is said to be “balanced”. So, right now in Queens we just hit 6 month’s supply as a county so overall it is balanced, however, month’s supply varies by neighborhood so in some areas it is still a seller’s market, and in other areas it is more of a buyer’s market. Either way, the fact that month’s supply has been steadily increasing this year is important to note and will be interesting to watch in the second half of the year. 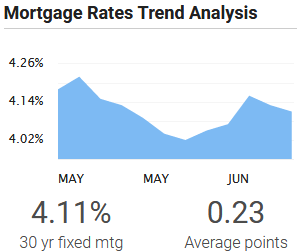 Rates are low right now so demand has spurred up recently, however, prices are very high too so we will have to wait and see if the low rates lead to increase in home sales. I just spoke to an agent/friend recently who sells a lot of real estate in Long Island and he said that in the last few months they have been seeing a hige surge in demand and offers on their listings. He also told me that 90% of their buyers are coming from the boroughs so what that tells me is that buyers are probably realizing that the prices in NYC are much too high and so they are probably venturing out to Long Island or New Jersey in search of more value for their money. This may be why we have been seeing a slump in home sales this year. We’ll keep watching the market and keep you posted on siginificant changes. 7/26/17 – Mortgage rates decreased this week. The benchmark 30-year fixed-rate mortgage decreased 2 basis points to 4.11 percent. The 15-year fixed-rate mortgage decreased 2 basis points to 3.31 percent. The typical 30-year jumbo mortgage decreased 5 basis points to 4.06 percent. The average 5/1 adjustable-rate mortgage decreased 2 basis points to 3.52 percent. The Long Island Board of Realtors reported home sales at a seasonally adjusted annual rate of approximately 731 homes during the month of June. This was an increase of 8.6 percent from May and an increase of 1.1 percent from June of last year. 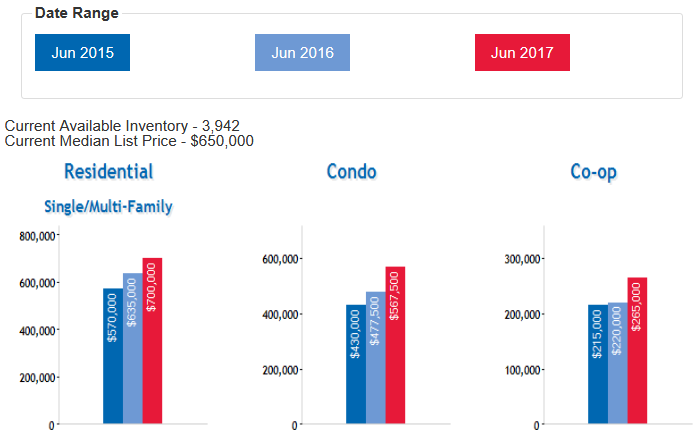 Specifically, Residential 1-3 family Queens home sales were UP about 2.2%, Queens Condo sales were UP 21%, and Queens Coop sales were DOWN 5.7% compared to this time last year. Over the last 12 months, Queens home sales are DOWN 1.8%. The median home price increased to $525K in June, which was up 9.7 percent from May and up 11.9 percent from June of last year. The median home price has increased by approximately $56,000 in the past year alone. 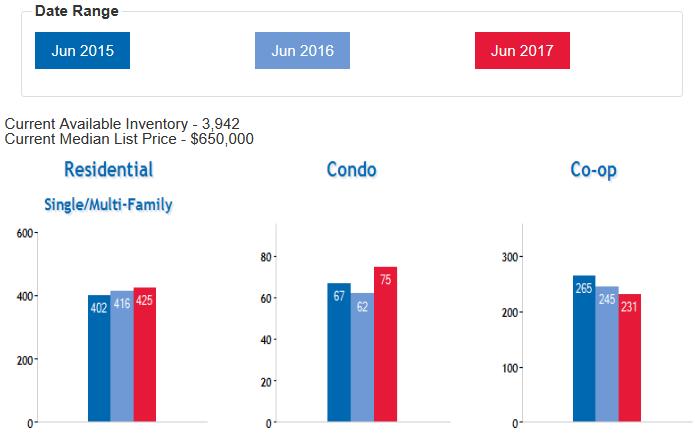 Specifically, Residential 1-3 family Queens home prices were UP 10.2%, Queens Condo prices were UP 18.8%, and Queens Coop prices were UP 20.4% compared to this time last year. Over the last 12 months, Queens home prices are UP 10%. There was a 4.2-month supply of housing inventory in May, which was up 2.4 percent from April. The total number of available homes for sale decreased by 10.6 percent compared to May of last year. Specifically, there are currently 2,622 residential 1-3 family homes for sale, 363 Condos for sale, and 886 Coops for sale in Queens county. Total: 3,871 Queens homes for sale.